Home>Articles>Welding of steel gas pipelines: quality control of welded joints. Operational control is a quality inspection during technological operation and after its finishing up. Preparing to the work and steel gas pipelines welding the following points are to be revised for the conformity with the standards: pipes arrangement, pipe ends restriking, cleaning, shape and size of the seams, the quantity and position of the tacks, the order of layers. Welded seam and the area from both sides from the seam (≥ 20 mm) should not have metal splashes, scales, slag and other contaminations. Absence of the burn through, cracks, surface pores, craters and deep undercutting. Observance of SNiP standards relative to joints displacement, the width of the seam and the sizes of the gap. Welded joints are checked selectively by mechanical tests and physical methods. Mechanical tests are realized for the welded joints made from the pieces of the pipes. 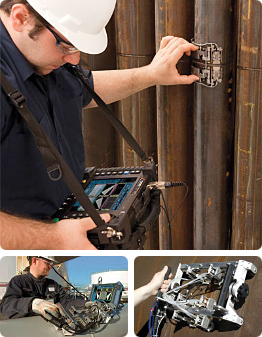 Mechanical tests help to control welder qualification joints, joints of indoor, on-ground gas lines, and the joints of underground gas pipelines (connected by gas welding). Yield strength degree (arithmetic mean value of the tests for one type of the joints) in lower than the lower limit of ultimate strength of the main piped metal. Bending angle (arithmetic mean value): for arc welding – less than 120º, for gas welding – less than 100º. Ultimate tensile strength or bending angle of minimum one of three chosen samples 10% less than required rate. Pipes with diameters of ≤ 50 mm are mechanically tested by flattering (50% of test sample) and by stretching (the rest of 50%). Welded joint is not considered as well tested for the stretching if the yield strength degree is less than low ultimate strength of the main piped metal. During flattering test the pipe is compressed till the appearance of the first crack on the seam. Then the size of the clear gap between working surfaces of the press is measured. It should not exceed the rate of the pipe wall multiplied to 5 (5S). The following methods are considered as physical: radiographic and ultrasonic. The first method is used to check welder qualification joint. 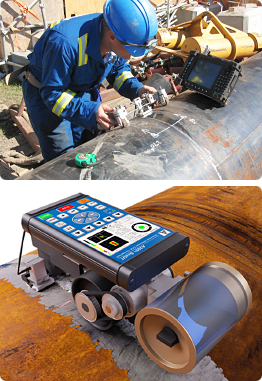 The both methods are used to check joints of inside and outside gas pipelines. Ultrasonic method should be certainly double-checked by radiographic method: ≥ 10% of chosen to be checked joints pass assure inspection. In case the only one joint checked by radiographic method gives unsatisfactory result the volume of radiographic inspection is increased to 50%. In case the defects are found out, completely all the joints, welded by the welder during last month, should be tested by radiographic method and pass ultrasonic inspection. The welded joints to be checked are chosen from the ones with the worst external appearance. Lack of fusion between beads and faulty root fusion. Ultrasonic method is applied to avoid exploitation of the tubes with welded seams which have defects with the length of > 25 mm where the dimension of the seam is 300 mm (if the length of the seam is < 300 mm the dimension of the defect should not exceed 10% of the perimeter). The results of the inspection by radiographic and ultrasonic methods should be confirmed by the protocol. Seams realized by gas welding where there was found a defect are not the subject to repair! Seams realized by arc welding which have defects can be repaired by welding up of removed part (less than 30% of the seam) which hasn’t passed the test. After the defect is repaired all the joint should be tested by radiographic method. Undercuttings are deleted by welding-on of the beads. Exceed height of the welded seam is removed by mechanical treatment. It is forbidden: to realize repeated repair and correct defects of the joints by recalking. In case the inspection by mechanical test and by physical method gave unsatisfactory result, there is realized an inspection of double quantity of the joints. In case there is found out at least the only one defect after the repeated physical inspection all the joints realized by the welder during last month on the object, should pass radiographic inspection. In case there are found out at least the only one defected joint after mechanical inspection, all the joints made by the welder during the last month on the object should be deleted (in case of gas welding) or should be tested by radiographic method (in case of arc welding). GOST 16037-80 Welded joining of steel pipes. SNiP III-42-80 The main pipelines.